I wrote a blog post a little while ago about the benefits of sauerkraut. You can buy it in the supermarkets but it is often pasteurised and therefore loses a lot of its beneficial bacterial properties. 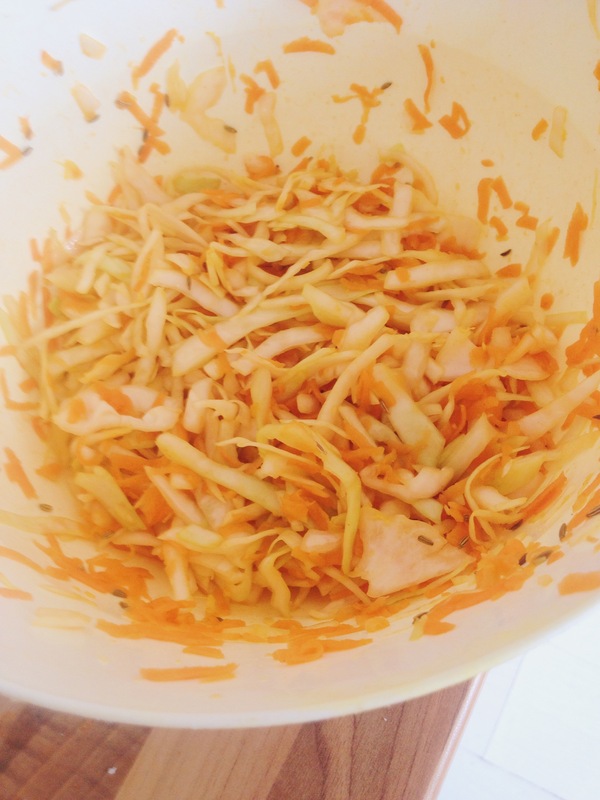 I tried out a recipe for making sauerkraut at home and it was delicious…so here it is.. The recipe is from Green Kitchen Stories, which is a blog-turned-book with wonderful vegetarian recipes. Wash the vegetables before slicing and grating. Place all of the ingredients in a large bowl. Get stuck in and use your hands to mix and squeeze everything together. The salt brings out the moisture in the vegetables so everything will become softer and more juicy as you mix it. Sterilise a jar and use tongs to transfer the mixture to your jar. Really pack it tight, forcing all of the air out and pressing down to coat the vegetables in all of their juice. When you first start putting the mixture in the jar it doesn’t seem like there will be enough juice to cover it, but as you go on and press down on the vegetables they will release more juice. Leave some space at the top of the jar but make sure you can see some juice over the vegetables. Fold up some whole cabbage leaves to place at the top of the jar to prevent oxidation and secure with an air-tight lid. Leave to ferment at room temperature for 3 weeks. After this time, remove the cabbage leaves and wipe round the top of the jar. 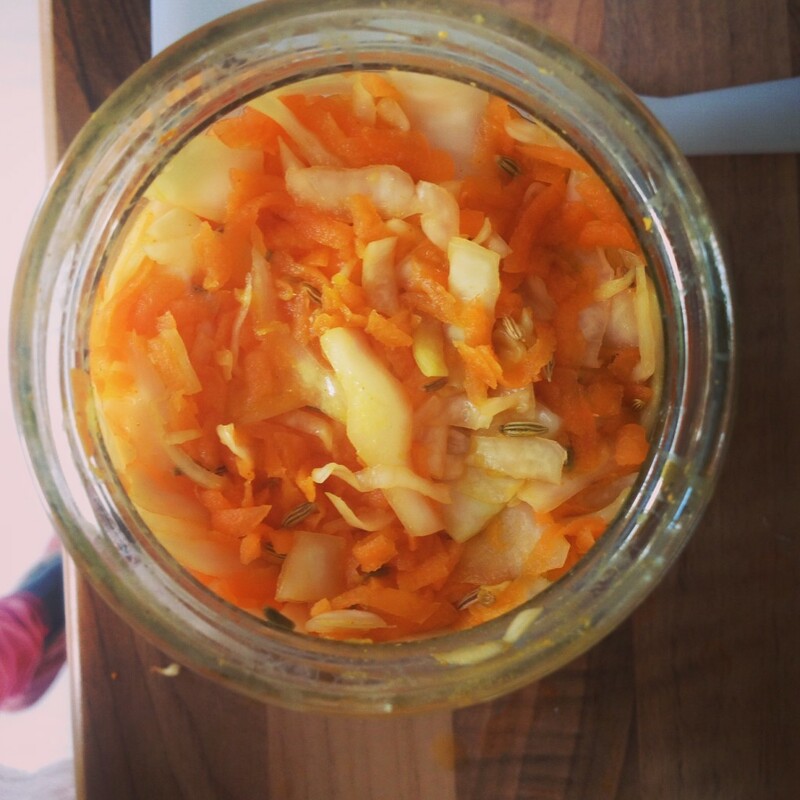 Don’t be alarmed at any mould, just clean the jar or transfer the sauerkraut to a fresh one. Everything should have softened but shouldn’t be mushy. Store in the fridge. A great addition to salads and a perfect side dish to meat. Your gut will thank you for it. Posted in Blog, Good foods, Recipes and tagged bacteria, cabbage, carrot, gut health, recipe, salad, sauerkraut, side dish, spice, vegetables.